Chilly temperatures call for rustic soups and stews. 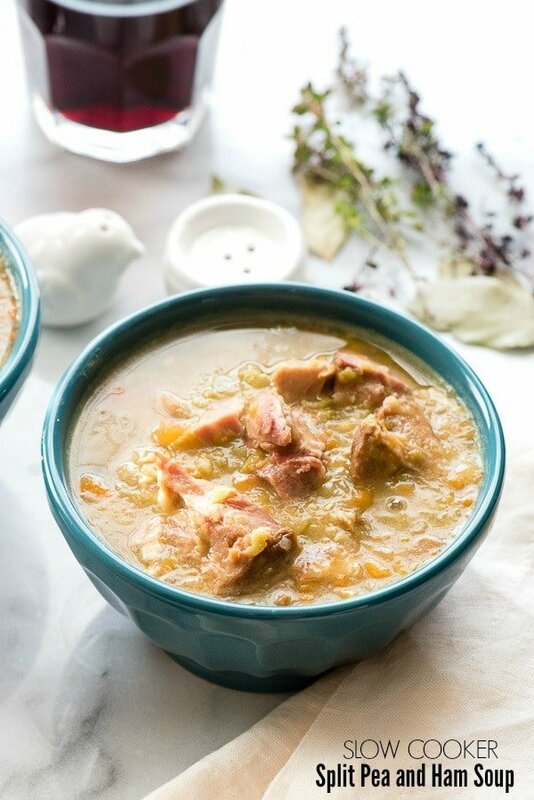 This classic Slow Cooker Split Pea and Ham Soup is just the ticket and a great way to use up holiday ham! 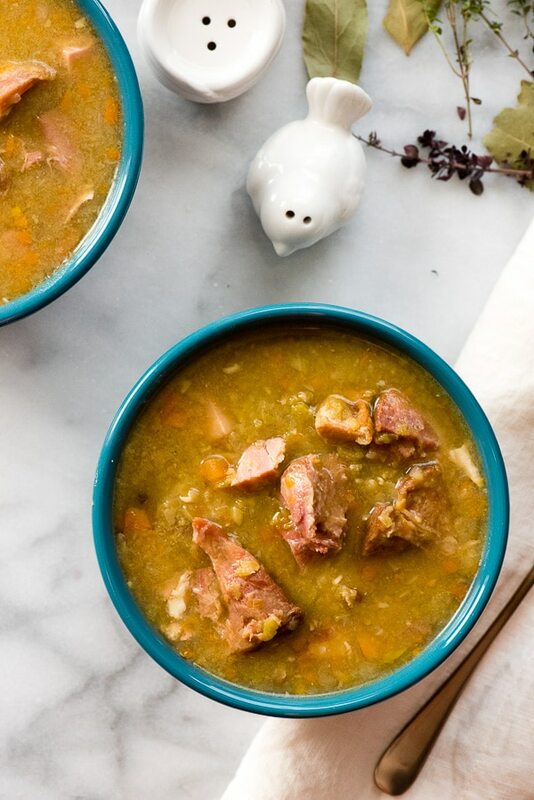 As we roll into the new year I wanted to share a delicious, comfort food soup that’s a snap in the slow cooker: Slow Cooker Split Pea and Ham Soup. It’s a perfect way to use up holiday ham AND the ham bone. The ingredients are simple and whole, AND the soup so much flavor! We had made Orange-Bourbon Glazed Bone-In Spiral Cut Ham over the holidays and I had forgotten about the ham bone which we’d put in a second refrigerator I rarely check. My husband migrated it up the kitchen refrigerator one day before we were headed out for the latest Star Wars move (did you see it? What did you think?). 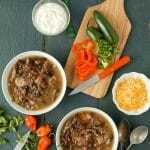 I put all the ingredients into the slow cooker and was so glad I did! By the time we got home everyone was famished and what we had planned for dinner was a few hours away. This sort of soup is really where slow cooker recipes shine. 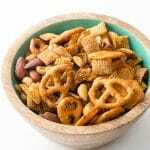 They slowly develop flavors over a longer period of time needing no involvement from you. 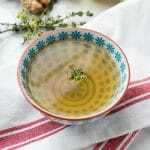 The classic basis for soup is onion, carrot and celery and they form such a delicious broth. When stirred after cooking the split peas melt into a thick creamy texture. It’s the type of soup that takes the chill off the day! If you want to make this and don’t happen to have a ham bone laying around, ham hocks may be substituted. Use 2-3 ham hocks which are easily found through the butcher at your favorite super market if they aren’t already packaged in the meat section or freezer. To get that chunky ham that is so good in soup you can request from the deli department to get ham slices that are ¼-inch or ½-inch thick and then cut them into nice cube before making the soup. This is definitely the type of soup you’ll want to make all winter long! 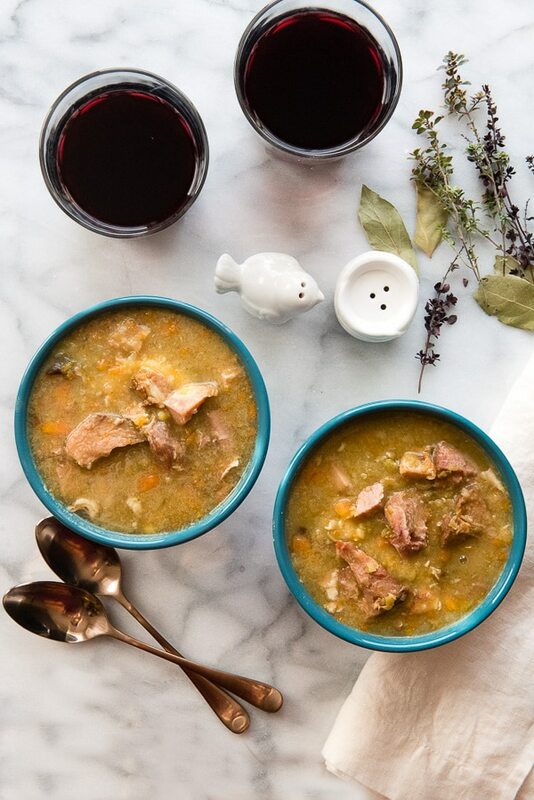 For those preferring a more traditional cooking method, this Split Pea Soup with Red Wine and Ham is another family favorite and is cooked on the stove top. This classic comfort soup is made even easier by preparing it in a slow cooker. 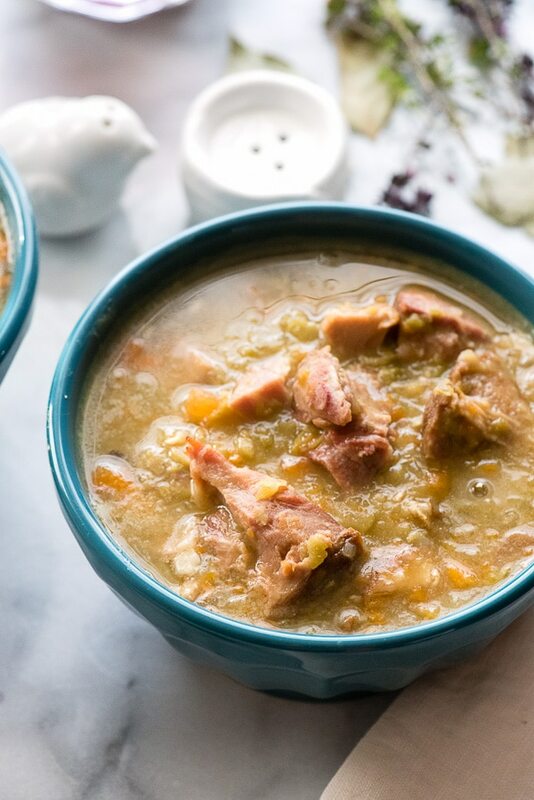 Hours of simmering create a rich depth of flavor in this Slow Cooker Split Pea and Ham Soup recipe with no effort from you! 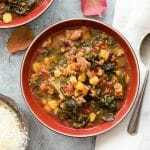 The low slow cooking develops fantastic flavor for this rustic, classic soup. It's a great way to use up holiday ham and the ham bone. Ham hocks may also be substituted any time of year. Add the vegetables to the insert of a 6 quart slow cooker. Add the split peas and place the ham bone on top. Pour in the chicken stock and add the bay leaves. Cook on LOW for 8 hours. Remove any meat from the ham bone and add back to the soup before serving. Salt and pepper to taste. Additional ham may be added if desired. I love soup especially during the winter, this will be a wonderful addition to my list of recipes! I’m sure my kids will love it too! This is the perfect recpe for this cold weather! My husband just loves split pea and ham soup. split pea soup is sooo tasty. this looks delish. total comfort food. This looks delicious. I plan on sharing this with my dad – he loves using the slow cooker. I’ll take your ham tip into consideration, thanks! And yes, I loved Rogue One. Definitely a tear-jerker! I love cooking soups in the wintertime. Split is one of my favorites! It’s supposed to rain and rain and rain all weekend.Perfect weather for warm soup like this yummy looking Split Pea. This looks good and your pictures are great! My husband loves split pea soup! This recipe sounds great I will have to make this for him! 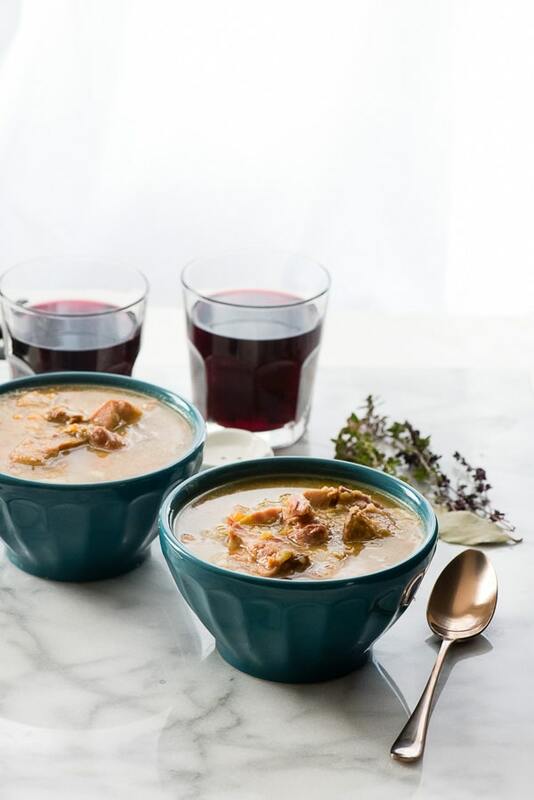 this soup is exactly what I love about winter- and your photos are just LOVELY- they make me want to dive in and devour those bowls! Thanks for sharing this recipe! 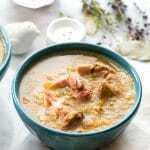 this soup is exactly what I- so your photos are just LOVELY- they make me want to dive in and devour those bowls!